The AquaticLife 14K 150W R7S HID Metal Halide Lamp can be used to replace any 150W R7S HID Metal Halide Lamp. Because it's double ended this metal halide lamp will also work in traditional metal halide fixtures. The 14K color temperature is most commonly used with reef aquariums. 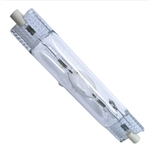 The AquaticLife 14K 250W HQI Metal Halide Lamp can be used to replace any 250W HQI Double Ended metal halide lamp. The 14K color temperature is most commonly used with reef aquariums.